Recently I have noticed people bringing their dogs with them on the river when they go whitewater rafting. As a dog lover and a whitewater boater, I want to stir a discussion on the merits and risks of taking dogs whitewater rafting. I once had a great river dog that made many trips with me to the river. Jenny was a black lab who LOVED the water. We did many flat water trips where she would swim beside me for awhile and then climb onto the back of my kayak or sit in my lap and ride for awhile before jumping back in to swim some more. But as a kayaker, there was no way of taking her down a whitewater river. For rafters, this is at least physically possible. I think most would agree that flat water is quite safe and class 5 whitewater is definitely out. The question then becomes: When does the risk outweigh the reward? Before you answer that, let me start by describing an event I experienced this weekend. I may have some details a bit off, but it’s close enough. I was kayaking with a group from the WRRR club on the Sauk River. The Sauk gauge reading was about 12,000 cubic feet per second (cfs) which I think equates to about 5000 cfs on that section. The Sauk is class 3-4 at that water level with plenty of rather large keeper holes (hydraulics). The group consisted of 2 solo oar rafts, 2 rafts with several people, 4 solo catarafts, one inflatable kayak and one kayak (me). One of the solo rafters had his dog in the raft with him. Well, I guess technically that means he isn’t solo. At one point the group was a bit spread out. The solo rafter with the dog dropped into a powerful hydraulic. Then one of his oarlocks broke. His dog got bounced out of the raft while the raft and oarsman stayed in the hole. The dog had on a life jacket and was swimming down stream. The current here was smooth and swift as it drained into the next rapid. The dog was about 20′ from the bank and there was little chance that the dog could reach shore before being washed into the next rapid which was a class 3 rapid several hundred yards long. Even if the dog could reach shore, it would have been hard to climb out of the river because the water level was high, the bank was steep and covered in overgrowth, and there was no slack water or eddy near shore. All of the other rafts were already running the next rapid and were out of sight or rescue range. The raft finally washed out of the hole and was about 50′ upstream of the dog. At this point the oarsman moved the oar into the triangular support for the oarlock to give him some ability to use that oar. He had very little control of his boat as he continued to wash on down the river and into the next rapid. Fortunately, the IK was close enough to help the dog. I saw it happen, but was too far away to help rescue the dog. The paddler in the IK was able to get to the dog and pull it from the 49 degree water and into his lap before washing on down into the rapid. We were extremely lucky that it turned out so well. As it was, only 4 of the boats in the group would have even been able to rescue the dog and still control their boat in the next rapid. One of those just happened to be close enough to help. The water temperature was cold enough that such a long swim through the next rapid would have been life threatening by the temperature alone (Keep in mind this chart is based on an adult human. Heat loss is faster for a 40 Lb dog though fur helps.) Also, the rapid downstream was long with several large hydraulics that could have drown the dog, even with a life jacket on. At best, it would have been battered and bruised. Dogs do not have any understanding of the dangers of whitewater, so owners should not think that the dog knows what to do if it finds itself swimming a rapid. Thinking “Oh, he’ll just swim to shore.” is a dangerous assumption. Even if the dog does swim to shore, is it going to the right one? Often, the closest shore is not the safest place to go. Once on shore, what will the dog do? In this case, there would have been no way to get back up to the dog. That side of the river was blocked by a rock wall along side the rapid. Hiking back upstream would have to be on the opposite side of the river which, as you can see from the video below, is over 100′ wide. Dogs do not understand the risks of a foot entrapment from standing up in swift water. Dogs cannot grab a rope and be pulled to shore. All rescue attempts are hands-on and require a person being put into the same risk as the dog. So not only does having a dog on the river pose a risk to the dog, it introduces an inherent risk to the entire group. 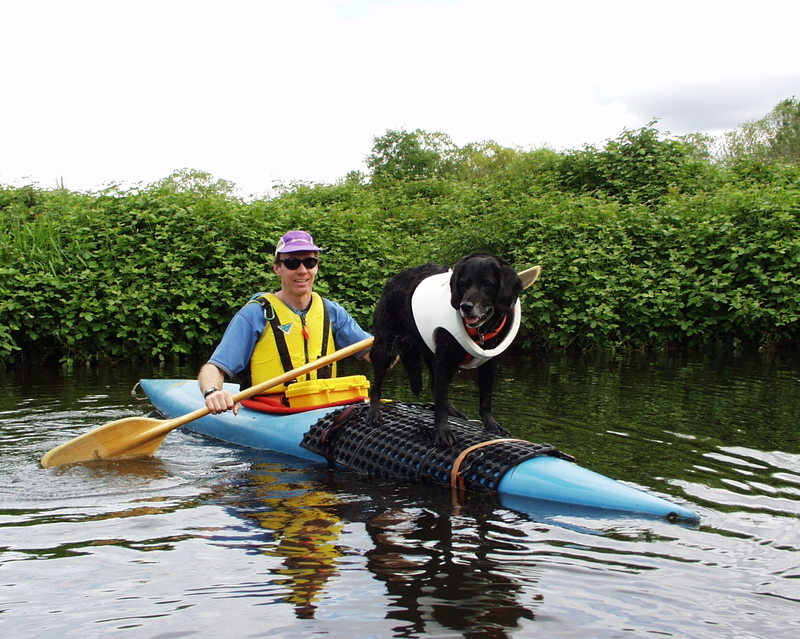 In this example, the person paddling the IK took a risk by rescuing the dog and running a rapid with it sitting in his lap. I took a risk by trying to get to the scene to offer help. The dog owner took greater risks trying rescue the dog while dealing with a broken oarlock. This time it turned out well, but there are plenty of other places or circumstances on this river where things could have been much worse. What if the oarsman had also been thrown from the raft? We would have given all our attention to him, not the dog. This swim happened in class 3 water. What if it happened in a class 4 rapid? What if it happened just upstream from a strainer log? What if it happened in the hydraulic upstream where one of our rafts got caught in a keeper hydraulic for 45 minutes? Yes, 45 minutes! Here is a brief video of that event. We did not take any big risks to try to free this raft from the hydraulic. But what if the dog were in that raft? I assure you, the group would have taken much greater risks. I have had my share of whitewater and flat water rescues. One of the things I was taught as a professional lifeguard was to always be asking “what if…?” and “what’s the worst thing that could happen?” then plan for it. Inevitably, you probably didn’t think of the worst thing that could happen, but it would at least help you prepare for what actually does happen so you don’t end up on the six o’clock news. So I ask you: Do dogs belong on whitewater? Posted on July 10, 2012, in Grand Canyon 2011 and tagged danger, dogs, drowning, rafting, rescue, risks, safety, whitewater. Bookmark the permalink. 3 Comments. Interesting post David as I’m doing a 3 day trip on the lower Deschutes this weekend with my dog. I’m rafting it. She hasn’t had alot of time on a river trip but I don’t have a dog sitter and my wife is out of town. It sounds like your trip was a bit sketchy to bring a dog. My judgement was, would I bring a child or my elderly parents on the trip. If yes, then the dog is fine. If no, then the dog probably shouldn’t go. I think another consideration is the age and health of the dog. My dog is a little older but healthy and athletic. I’ve been on lots of class III trips with dogs and it’s always worked out well with no issues so I think that is the limit for me. No class IV and up. Yes, based on feedback being posted so far in other forums in response to my post, it seems the line is drawn at about class III to class IV for most people, though opinions vary widely. Some people base the decision on the skills of the owner and dog and the difficulty of the river while others say it is more about the level of danger the river poses which may or may not match the difficulty rating. Then there is the question of assumed risk by the other people in the group. Even if they might not take additional risks to save the dog, the owner might. And everyone agrees they would take risks to save the owner. Therefore, whether directly or indirectly, they automatically take on a greater risk. There is also the effect of what I will name “risk creep”. Like scope creep in project management terms, risks can add on slowly, almost imperceptibly, until suddenly something bad happens. Discussions reveal this was the case with several factors including an unexpected rise in water level. As is the nature of whitewater, everyone has a different level of risk tolerance. What is different about this circumstance is that dog owners may not fully assess the risks to the dog, themselves or the group and they may not convey nor get acceptance of the added risks by the group they are paddling with. 1. The probability of a particular event happening. 2. The impact or severity if the event should occur. Both must be considered in your decision. Also, all stakeholders should have a chance to participate in the decision. Interesting. This is exactly how we evaluate risks in Project Management. I expect the conversation to continue and I hope it will. Great insights are being vetted. Thanks to everyone for reading and contributing to the discussion! wow i have had only a few white water experiences mostly class 3, but this morning as on many mornings when there has been lots of rain and snow melt my dog goes nuts playing in the white water of a local stream…this morning i thought i should take him on a white water trip but i guess i need to review my thoughts.